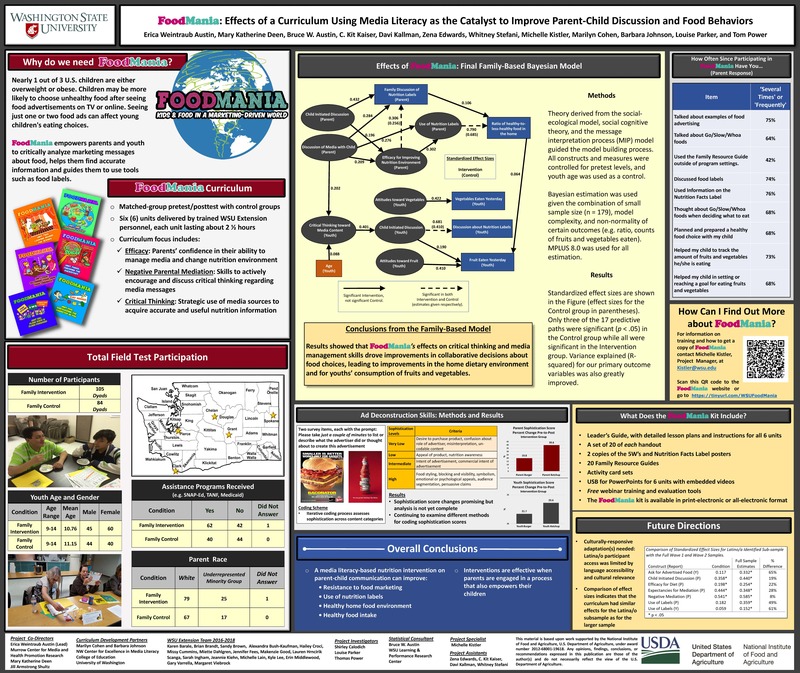 FoodMania is a NEW media literacy program for improving family conversations and skills related to food marketing and nutrition. 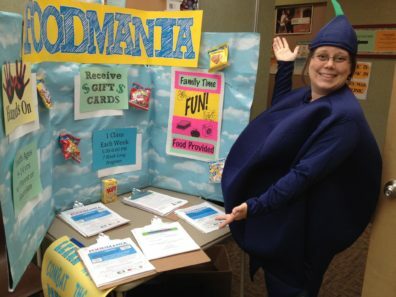 FoodMania is the FIRST family-based media literacy obesity prevention program. Youth ages 9-14 and a parent attend the 6-class series together. Kids & Food in a Marketing-Driven World was written and produced as a collaboration among Washington State University’s Murrow Center for Media & Health Promotion Research, Washington State University Extension, the Washington State University Department of Human Development and the NW Center for Excellence in Media Literacy, University of Washington. Children ages 9-14 and their families. Why do we need FoodMania? Nearly 1 out of 3 U.S. children are either overweight or obese. Children may be more likely to choose unhealthy food after seeing food advertisements on TV or online. 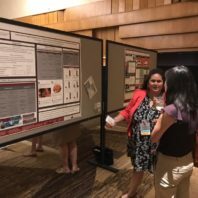 Seeing just one or two food ads can affect young children’s eating choices. FoodMania is innovative and unique. Most media-related educational programs that target school-age youth try to convince families to use less media, often with limited success. 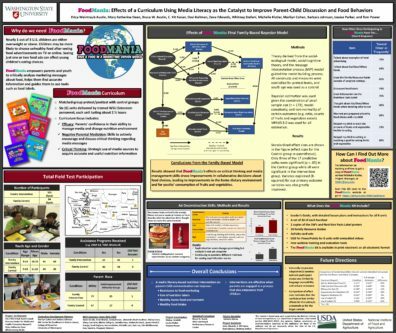 FoodMania empowers parents and youth to critically analyze marketing messages about food, helps them find accurate information and guides them to use tools such as food labels. 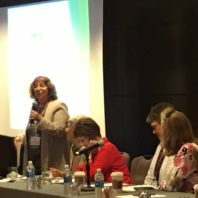 What are the goals of FoodMania? The ultimate goals of FoodMania are to 1) increase parent purchasing and youth consumption of fruits and vegetables and 2) decrease parent purchasing and youth consumption of foods high in calories, fat, sugar and salt. 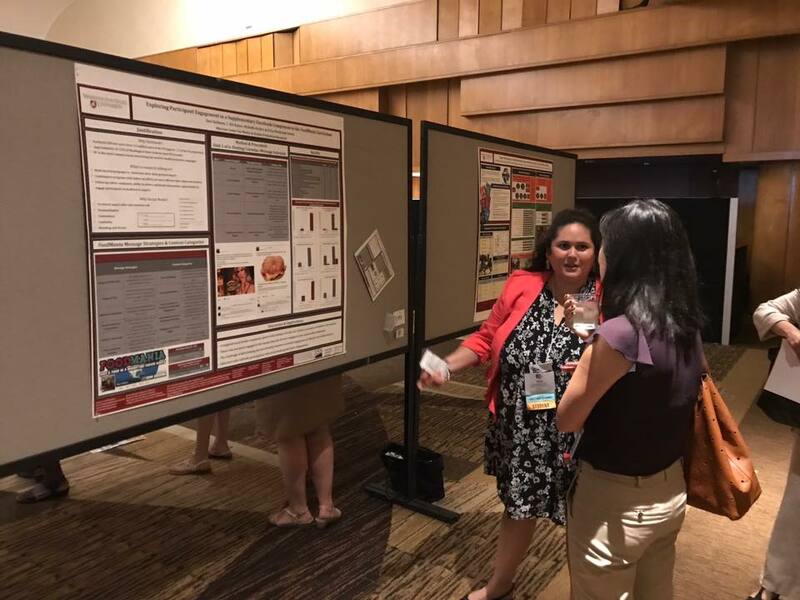 These outcomes occur as a result of increased parent expectancies about discussing media messages and providing healthier foods. 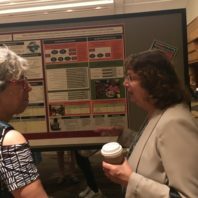 This leads to increased parent-child discussions about media messages about food and improved critical thinking and media literacy among youth. What does the FoodMania kit include? 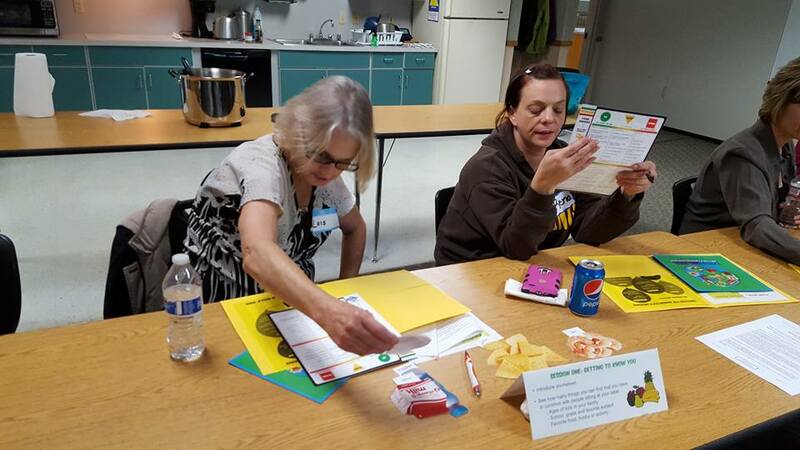 The FoodMania kit will be available in print or electronic format. 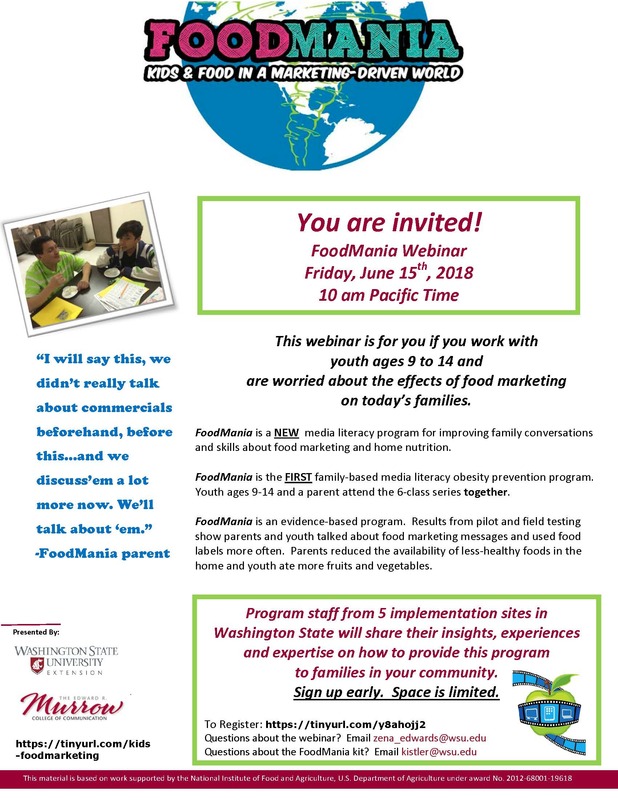 A FoodMania webinar will be available to those who work with youth ages 9 to 14 and are worried about the effects of food marketing on today’s families. 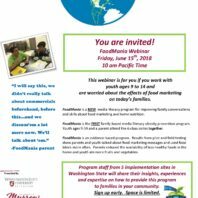 A webinar was available to interested parties Friday, June 15, 2018. 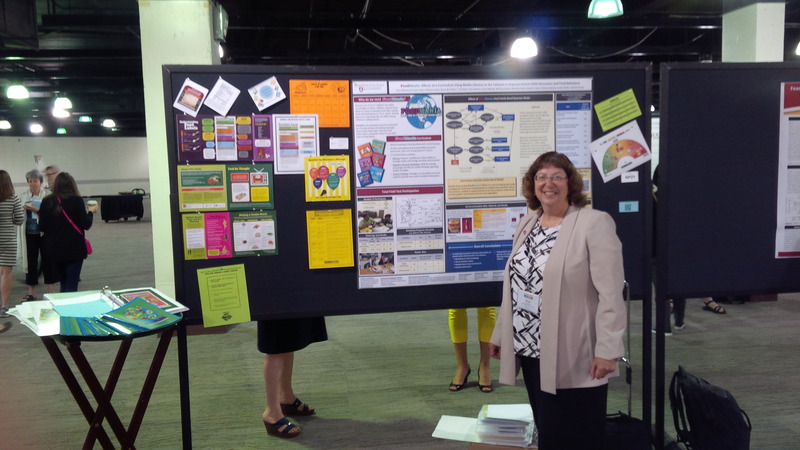 If you missed the webinar and are still interested in the curriculum, please contact Michelle Kistler at kistler@wsu.edu. How do we know FoodMania works? 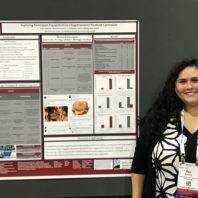 A field test of FoodMania in five Washington state counties demonstrated that it improved families’ use of nutrition facts labels for nutrition information, increased parents’ critical discussion of food marketing with youth, reduced youths’ susceptibility to food marketing, improved the home food environment, and increased youths’ consumption of fruits and vegetables. Information about the outcomes can be found HERE and further down this page. 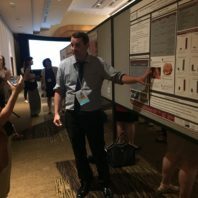 How can I learn more about FoodMania? 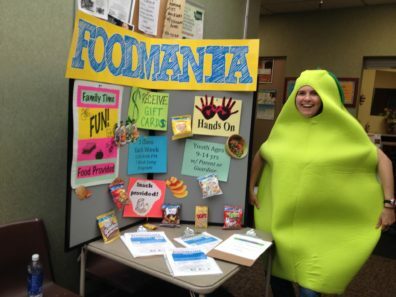 For information on how to get a copy of FoodMania contact Michelle Kistler, Project Manager at kistler@wsu.edu. 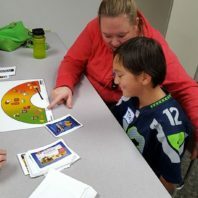 What do families do in the FoodMania program? 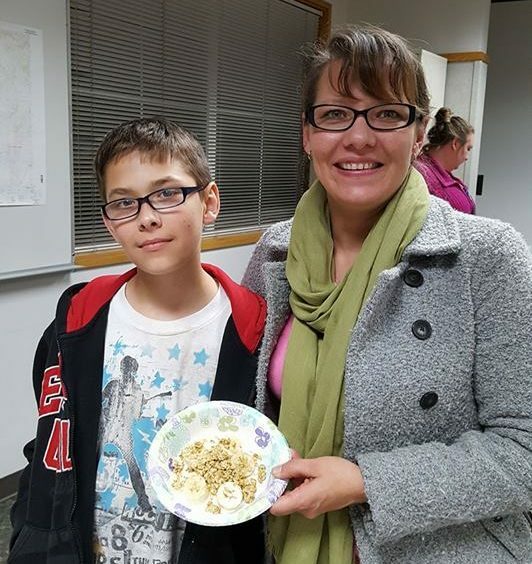 Youth ages 9-14 attend 6, 2-hour sessions with a parent. 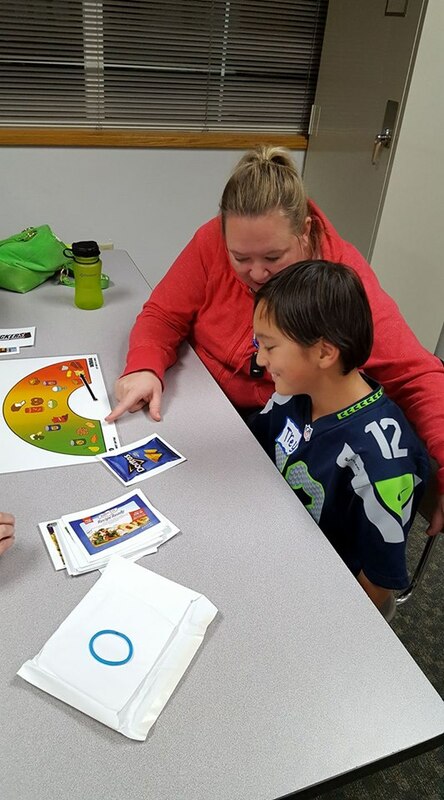 For the first five sessions, parents and youth meet in separate groups and then come together during the second hour for a group lesson. The final session is designed as a celebration for the parents and youth to enjoy together. Setting the Stage: General background information to provide context for the new information a lesson will introduce. 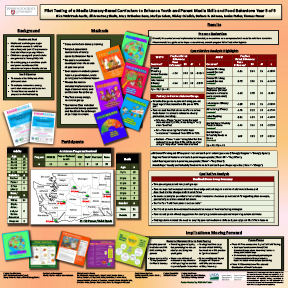 Designed to engage parents and youth in relating to their previous experiences and knowledge. Lights, Camera: Provides information which the participants will need in order to take action and relate to their own experiences. Action: Opportunities to apply new information to daily life. Includes hands-on activities, small group discussion and brain-storming. Flash Back: Parents and youth get a chance to reflect on the content from the day’s lesson. The questions provided encourage parents and youth to share their personal perspective. Flash Forward: Parents and youth get a preview of the next session. 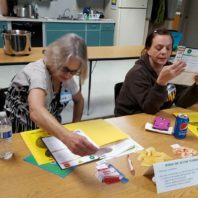 They are given a take-home activity to complete together and encouraged to apply the information from the session at home. 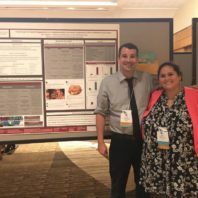 FoodMania was made possible through funding by the National Institute of Food and Agriculture, U.S. Department of Agriculture, under award number 2012-68001-19618 to Washington State University. Austin, Erica Weintraub, et al. 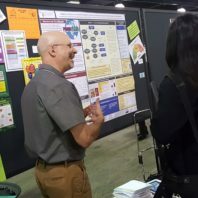 “The Role of Parents’ Critical Thinking About Media in Shaping Expectancies, Efficacy and Nutrition Behaviors for Families.” Health Communication 30.12 (2015): 1256-1268. Kallman, D., Kistler, M., Kaiser, C.K., Austin, E.W. (2017, November). 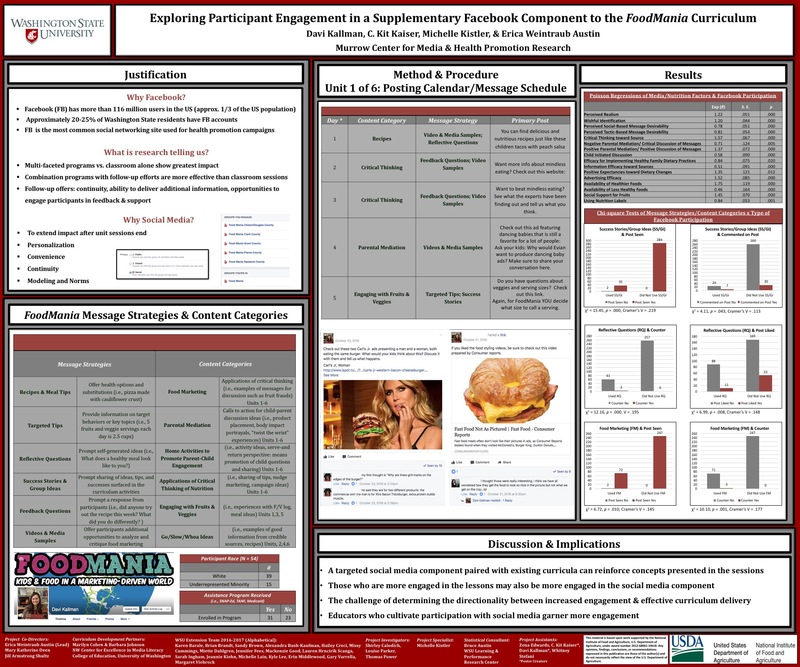 Exploring participant engagement in a supplementary facebook curriculum. 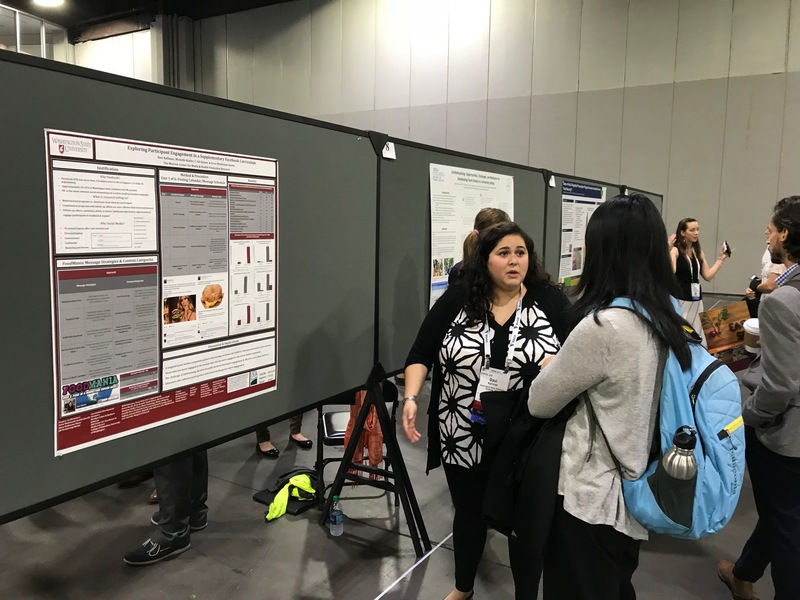 Poster presented to the American Public Health Association Annual Meeting, Atlanta, GA.
Austin, E. W., Deen, M. K., Cohen, M., Johnson, B., Power, T., Austin, B., Kistler, M., Edwards, Z., & Kallman, D., Kaiser, C. K. (2017, July). 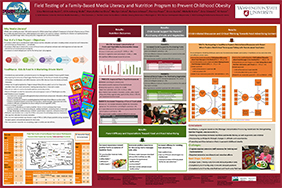 Stage 2 field testing of a family-based media literacy and nutrition program to prevent childhood obesity. 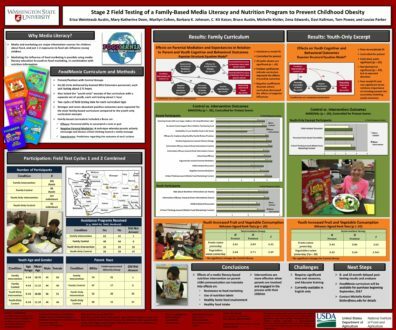 Poster presented to the Society for Nutrition Education and Behavior, Washington, D.C.
Austin, E.W., Austin. B. W., French. B., & Cohen, M. A. (2017, May). 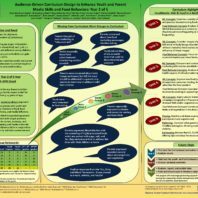 The effects of a nutrition media literacy curriculum on parents and children. 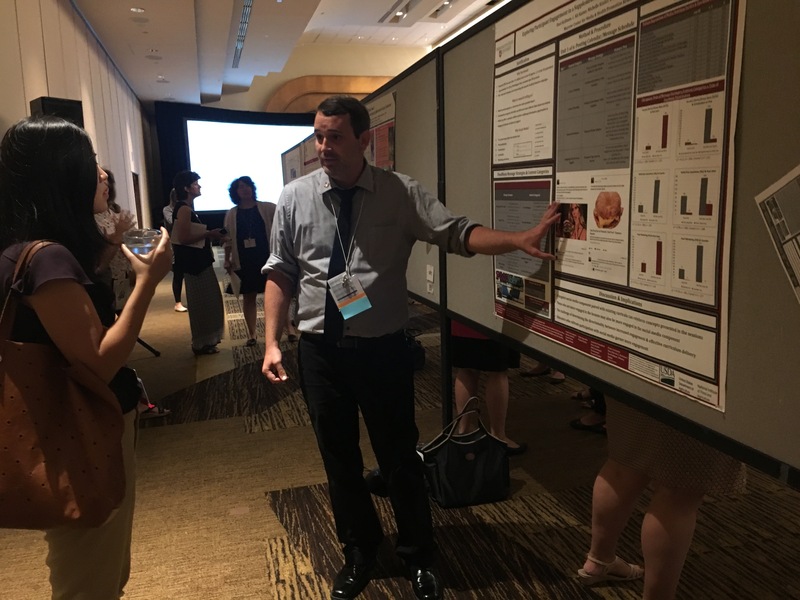 Paper presented to the Health Communication Division of the International Communication Association, San Diego, CA. Austin, E. W., Shultz, J. A., Deen, M. K., Cohen, M., Johnson, B., Power, T., Austin, B., Kistler, M., Edwards, Z., & Kaiser, C. K. (2016, August). Field testing of a family-based media literacy and nutrition program to prevent childhood obesity. 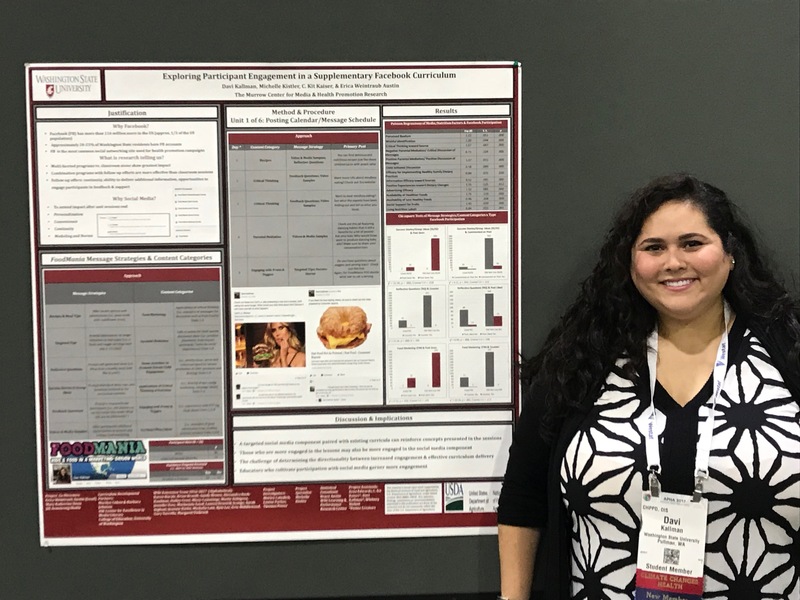 Poster presented to the Society for Nutrition Education and Behavior, San Diego, CA. Austin, E. W., Shultz, J. A., Deen, M. K., Cohen, M., Calodich, S., Johnson, B., Parker, L., & Power, T. (2015, July). 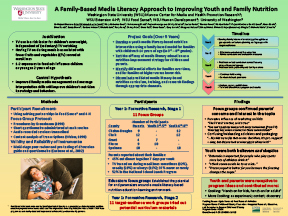 Pilot testing of a media literacy-based curriculum to enhance youth and parent media skills and food behaviors: Year 3 of 5. 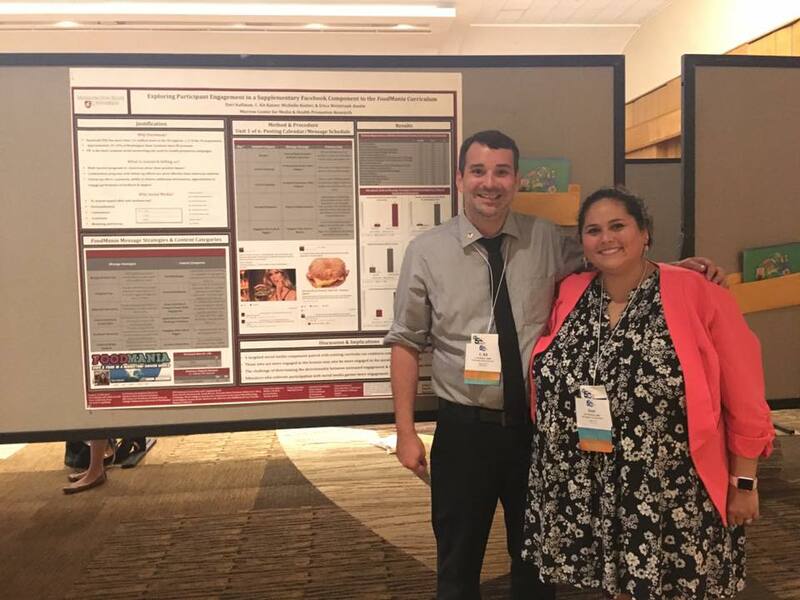 Poster presented to the Society for Nutrition Education and Behavior, Pittsburgh, PA.
Austin, E W., Shultz, J. Armstrong, Cohen, M., Parker, L., Calodich, S., …Kallman, D. (2014, June). 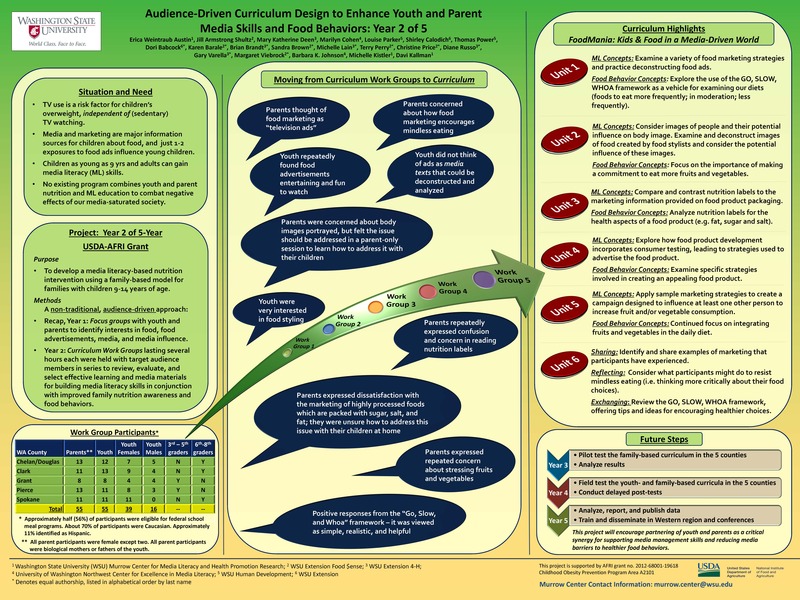 Audience-driven curriculum design to enhance youth and parent media skills and food behaviors: Year 2 of 5. 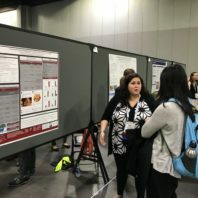 Poster presented to the Society for Nutrition Education and Behavior National Conference, Milwaukee, WI. Austin, E. W., Deen, M. K., Shultz, J. A., Calodich, S., Parker, L., Power, T., … Xu, S. (2013, August). 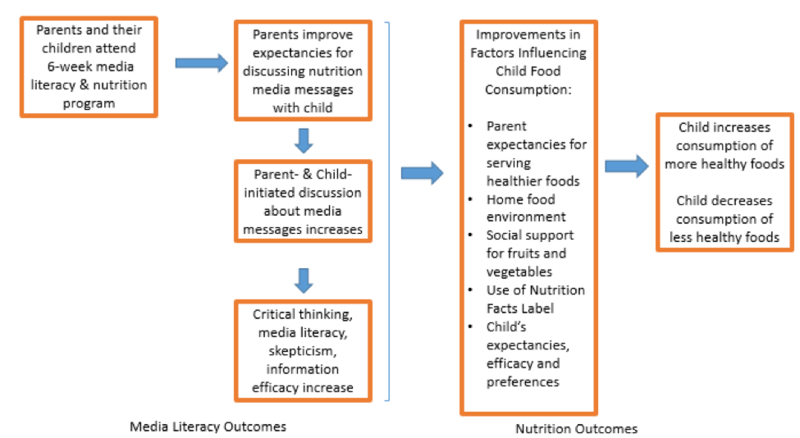 A family-based media literacy approach to improving youth and family nutrition. 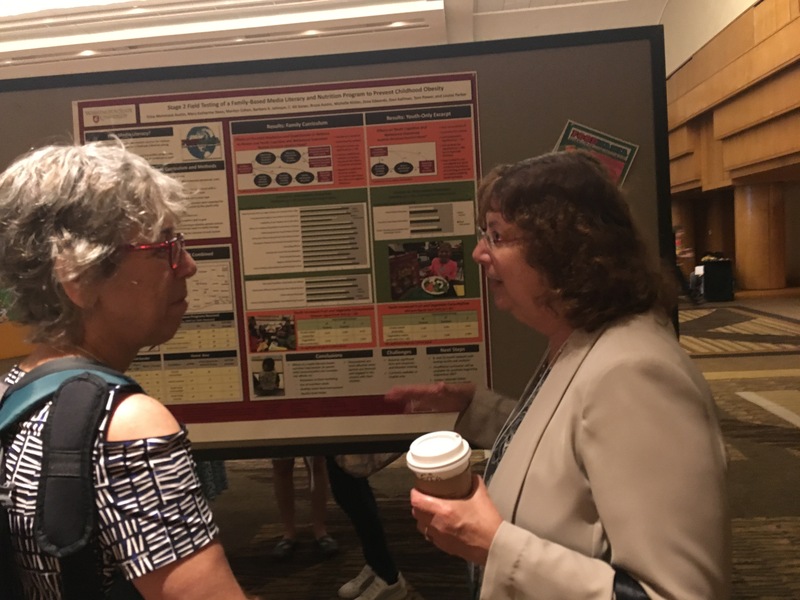 Poster presented to the Society for Nutrition Education and Behavior, Portland, OR. Austin, E. W. (2017, July). Featured success stories for AFRI grants program. 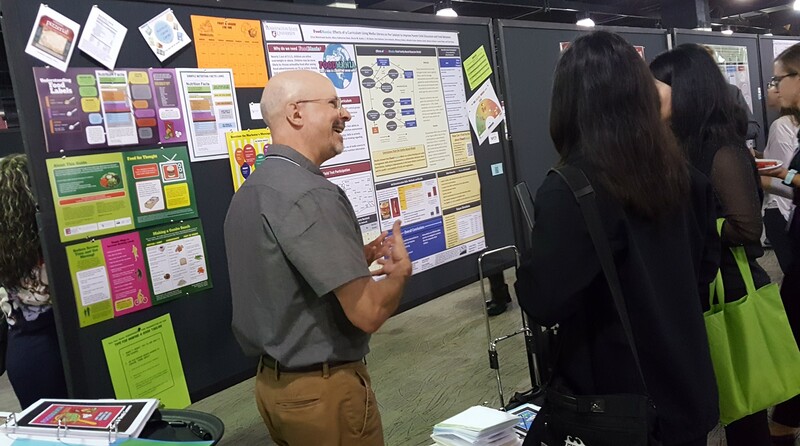 Presented to the Society for Nutrition Education and Behavior, Washington, D.C.
Kallman, D., (2016, November). 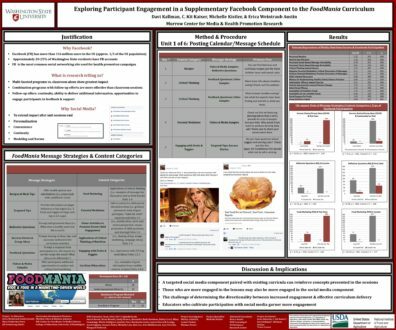 Audience-Driven Social Media Curriculum to Enhance Parent Medial Skills and Food Behaviors. 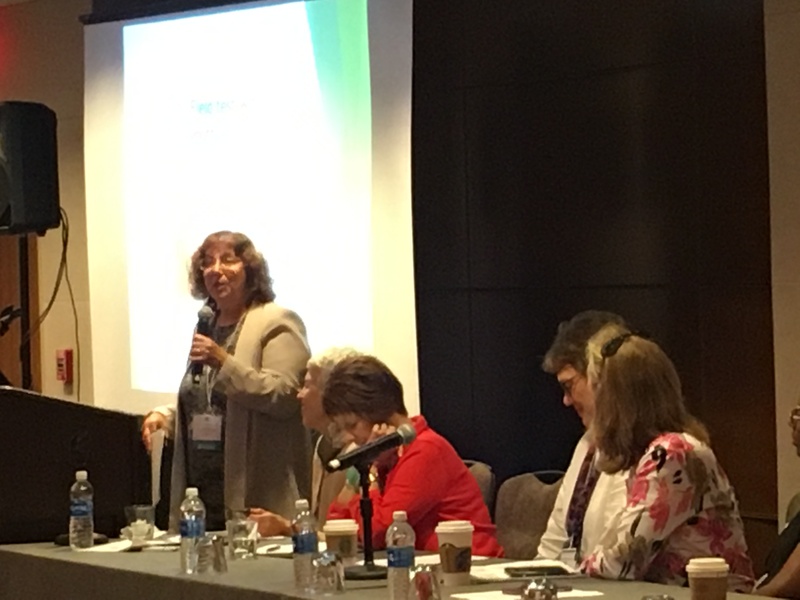 As part of mHealth for Underprivileged Communities: Challenges and Opportunities. 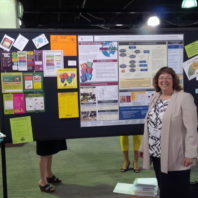 Presented to the National Communication Association, Health Communication Division, Philadelphia, PA.